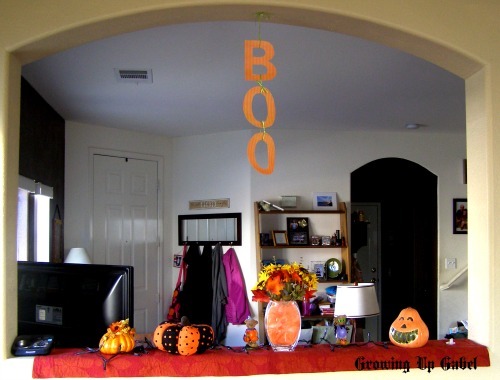 Use some fun Halloween printables to create Halloween decorations and memories! Download the printable Halloween papers and embellishments, and print them. 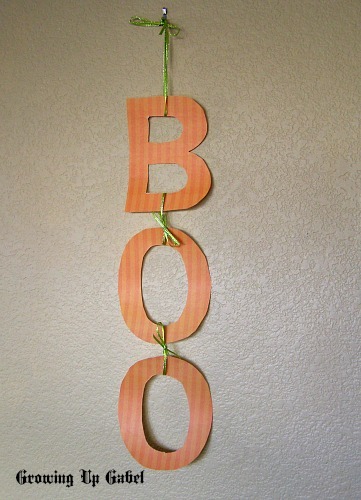 Then use a homemade stencil and ribbon or yarn to make a cute and inexpensive Halloween decoration for your home. 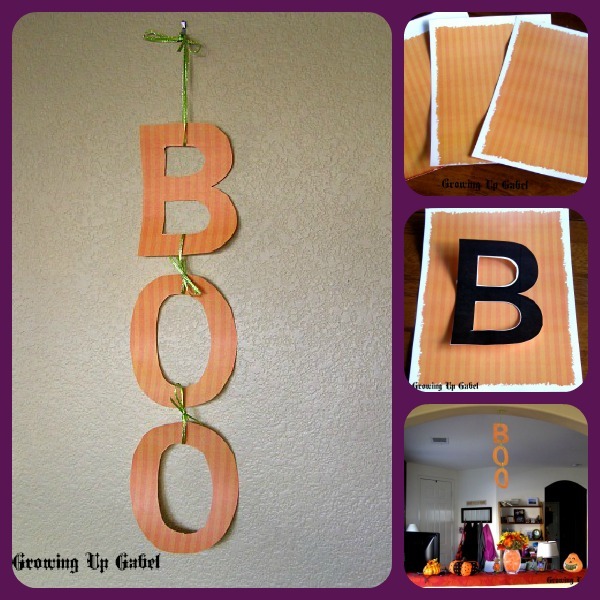 Last year I made this cute Halloween craft using wood letters, scrapbook paper, Mod Podge, and yarn. It was super easy and turned really cute! But I still had to make a trip to the store to get the wood letters and scrapbook paper. 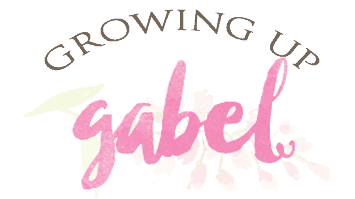 I much prefer to use items I have on hand when I craft – free is good! I decided to re-create this craft using items I have hand or could find on-line. 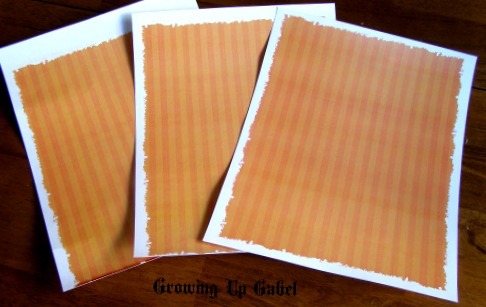 First, download and print the scrapbook paper you like from these free Halloween printables. I printed on to card stock to make it a little sturdier. I had a hard time getting the black polka dot to print so I just used the orange stripes. But feel free to mix and match. Print out the cool Halloween paper you want to use. 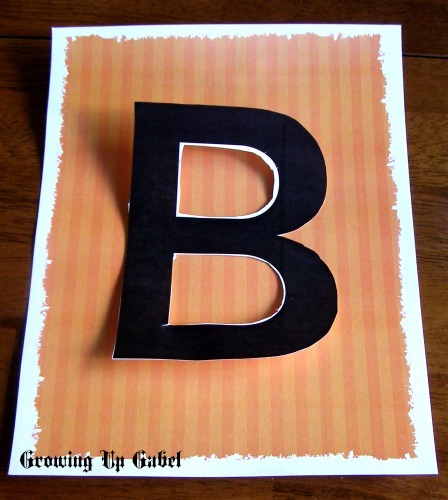 Next, free hand draw the letters “B” and “O” on the paper. Alternatively, you can make a free stencil for yourself by printing out a single letter on a word processing document. I set my font size to 700 for the ones I used. Of course, if you're lucky enough to have a cool cutting machine that you just hook up to your computer, then just use that to cut out the letters and I'll be super jealous. These homemade stencils are a 700 font size. Trace the stencils on to printable Halloween paper and cut out wishing you had a cool cutting machine to do this for you. 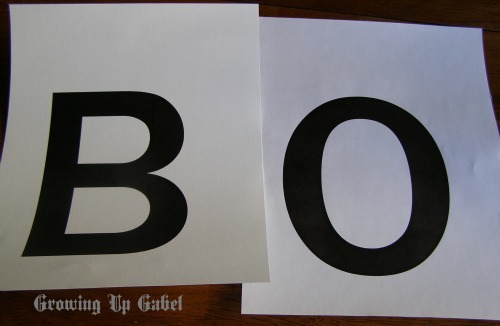 I traced the stencils on to the BACK of the Halloween paper, but if you do that make sure your B is backwards! Trace the letters and cut them out. Once the letters are all cut out, string them together. I used some ribbon and just tied them together, but yarn or string would work, too. You could also hole punch the letters and tie them that way. All done and super cute! I decided to hang mine above my little holiday inspired “mantle”/ledge. I love it! The final product above my Halloween “mantle”! This craft is an easy way to take a free Halloween printable, use items you already have on hand and create a cute Halloween decoration for your home. Need another idea for this super cute paper? How about making Happy Hour Project's treat boxes? Fill them with some candy and hand them out next week! This is a sponsored post but all opinions and the craft tutorial are mine! 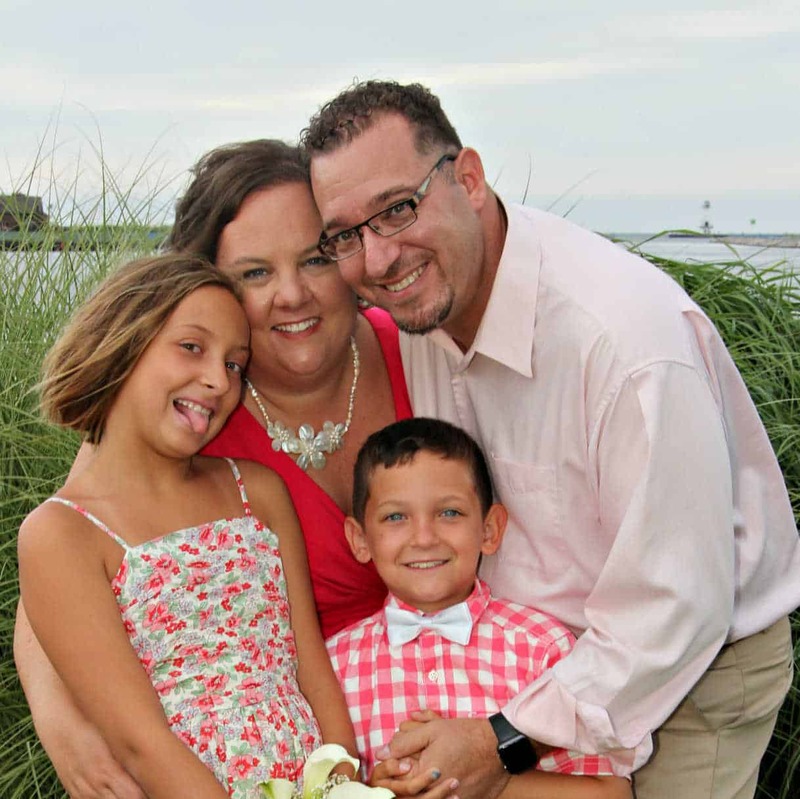 Thanks for the tip where to find printables! Crafting and decorating for the Holidays is always so much fun. Cute idea. These are great! I love homemade decorations! They have so much personality! I think even I can do that and not mess them up! Your BOO is super cute and I’m the “old school” type of crafter too. It’s fun to work with colorful paper. Thanks. Very cute! I really like how that looks hanging down in that opening. I was just thinking I’d like to cut some of my paper treat boxes with Halloween paper for treats for my coworkers… just been dragging my feet getting to the store, so this site is perfect to just print it at home instead!! Thanks so much for the resource!! These would make amazing treat boxes! I edited the post to include a link, if anyone would like to make them! It looks great with your mantel/ledge! I wouldn’t have thought to use just the paper, GREAT IDEA!